Olympian Michael Phelps swam the semifinals for the 200m butterfly Monday, coming in second and landing a spot in Wednesday's final. But the real drama took place before the starter's pistol even went off. Waiting in the "ready room," Phelps sat under a hood projecting more attitude than an 8th-grade detention. South African swimmer Chad Le Clos danced around in front of Phelps doing his own pre-swim routine, and Phelps was seriously not amused. In fact, he looks outright angry. Le Clos, you may recall, grabbed gold over Phelps at the 2012 London Games. Respect for fellow competitor appears to have been lost in the ready room. Phelps had murder in his eyes as he tried not to watch Le Clos shadow box and shake out his groin right in Phelps line of vision. Naturally, the internet couldn't contain itself. It was instantly recognized as a gold medal opportunity in the world of memes. Here's a taste of what the internet had to offer immediately after Phelps's stink eye hit the TV.
.@MichaelPhelps wants to Curb Chad le Clos' Enthusiasm. "That was a bit of an angry swim," said NBC's Rowdy Gaines after the race. Yes. It clearly was. 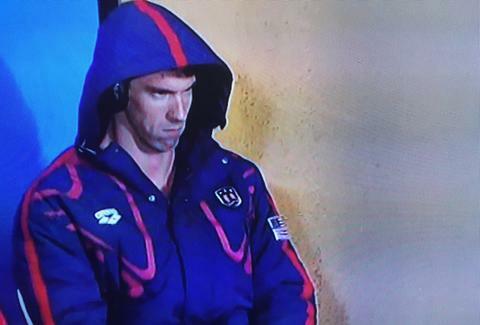 Phelps couldn't even hide his frustration afterward, despite his best effort. Michelle Tafoya asked Phelps what he thought Le Clos's pre-race ritual. "He does his thing," Phelps responded, "I do mine." Despite the ban on GIFs of Olympic events, the internet will also do its thing. Dustin Nelson is a News Writer with Thrillist. He holds a Guinness World Record, which is basically the same as a gold medal. Follow him @dlukenelson.